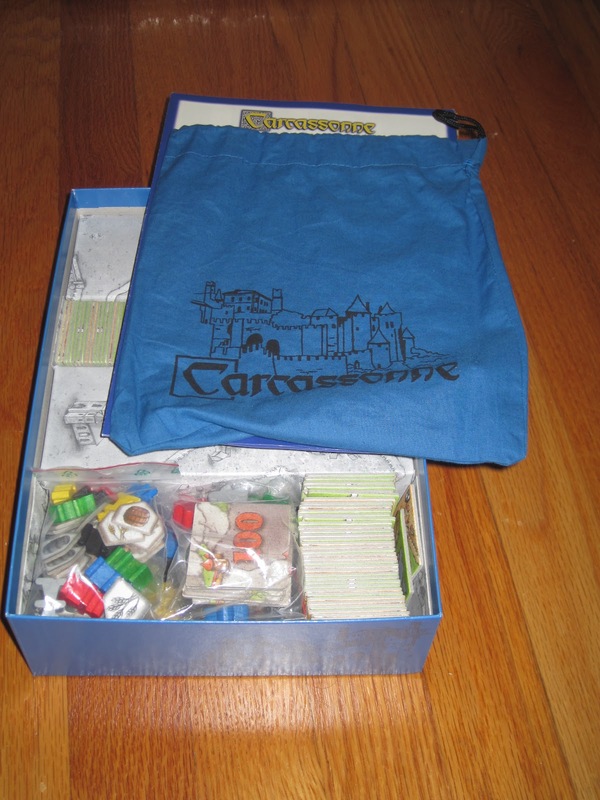 It’s hard to imagine a time when Carcassonne didn’t have a million expansions available, but seriously, there was one. There was a time when medieval city-building enthusiasts were drumming their fingers on their gaming tables, waiting for the next Klaus-Jurgen Wrede brainwave. And before Carcassonne jumped the shark, there was Inns & Cathedrals. So what do I think of this expansion-before-the-others? Find out below! Inns & Cathedrals follows much the same rules as the base Carcassonne game (you can read @Futurewolfie’s review here, or my review here), but it adds a few minor variations. The first variation is more of a continuation. Inns & Cathedrals includes pieces to include a sixth player (gray) and several new landscape tiles to account for more situations. These landscape tiles fill in some of the gaps created by the original tile set and eliminate some of the power moves from playing with just the base game. This is an Inn-on-the-lake. The shadow meeple denotes the expansion so tiles are easy to sort. The second variation is the Inns and Cathedrals themselves. Inn-on-the-lake tiles feature roads that are beautified. Thus, a completed road with at least one inn on it is worth +1 point per tile. However, if a road with an inn is not completed by game’s end, that road is worth 0 points. Similarly, Cathedral tiles (of which there are two) generate +1 point for each tile and pennant in the city when it’s completed. However, Cathedral tiles are even more volatile, being open on all four sides. An incomplete city with a Cathedral at game’s end is worth 0 points. 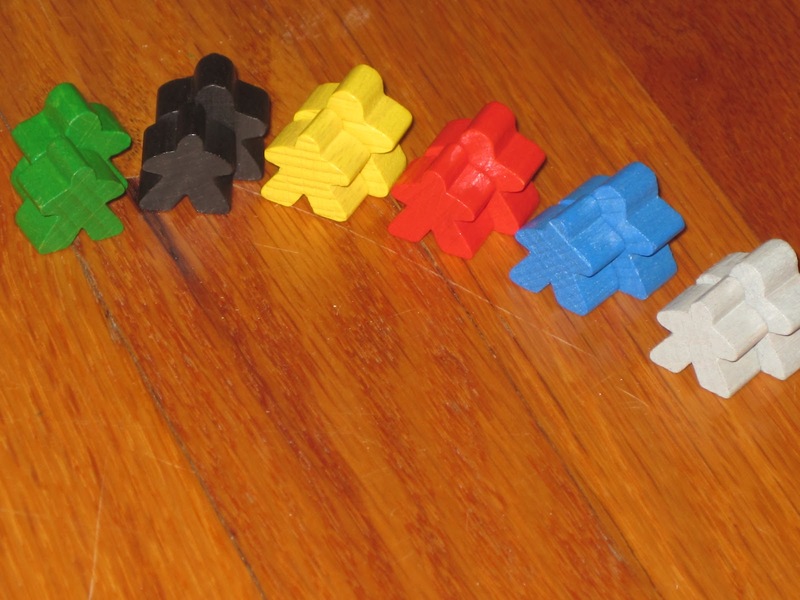 The third variation is the bullies, the big meeples. Bullies are played and retrieved like regular followers, but when determining who owns a feature, the bully counts as two followers. Inns & Cathedrals also includes several scoring tiles to help players determine how many times they’ve been around the board. I’m not sure where you fall on the expansion debate (love them? hate them? find them annoying? think they encourage designers to make incomplete games? ), but I fall into the “love them” category. Yet even for me, I recognize that most expansions, while perhaps making a game more fun, do not fall into the “necessary” category. But Inns & Cathedrals is the exception: it is necessary to the game of Carcassonne. Why do I say it’s necessary to the game of Carcassonne? Well, first of all, it fixes some of the situations that the base game could put a player in. A malicious player could prevent another player from ever completing a feature through the aid of certain tiles. And while that will always be a possibility in this game, I appreciate the new terrain that at least keeps all players on their toes. “This is a tight spot…but what if Lenny draws this tile?” is a frequent thought at the table. I also love the Inns and Cathedrals aspect of the expansion. Especially toward the end of the game, it opens a lot of space to mess with your opponents. “There are only a few tiles left in the bag? How about a Cathedral in that city you’ve been working on all game!” Of course, this is always a gamble. Playing a Cathedral in an opponent’s city is awesome if they can’t finish it; it’s not so great if they do. Inns are less risky as completing a road is a much easier achievement and there are many Inns in the set. The Inns and Cathedrals are also simple enough that I can throw them in the game even with complete newbies and they understand them. 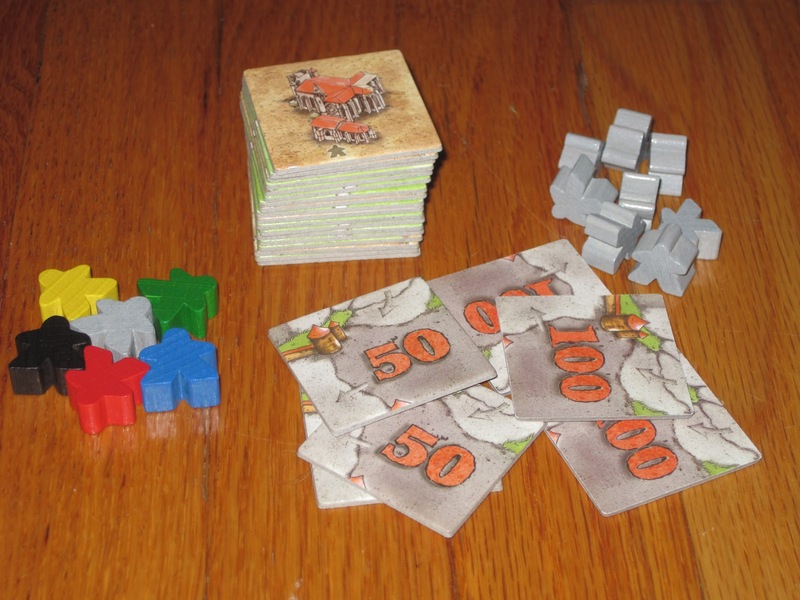 Bullies and regular meeples for a size comparison. No, there isn’t a ton of difference in size. I don’t include the bullies in my games often. The rules refer to them as “large followers,” so my calling them “bullies” reveals my bias. The bullies change the game. I enjoy the way they change the game, but not all players do, and new players especially can be at a disadvantage in knowing when to play their bully. A well-placed farmer bully can swing the tide of the game, but it uses the bully early and permanently. Playing the bully often can be great, but only if you play him in the right place at the right time (you don’t want him in an abandoned Cathedral city). Giving each player a powerful piece provides another interesting choice, but if your playing partner doesn’t enjoy spite, my recommendation is to leave the bully out of it. If you include the bully, I also recommend a small house rule: remove one of your other followers from your pool. Having a bully in addition to your other followers makes the game feel too easy and removes some of the tension present in the base game: how do I place my followers in the best positions to score big points while still capitalizing short term? Like I said, Inns & Cathedrals is to Carcassonne what Intrigue is to Dominion. No, it’s not the most exciting set, as it doesn’t add anything “cool,” but what it adds is necessary. You can play the game without it, but I just wouldn’t recommend it. Occasionally, @FarmerLenny and I actually agree on something. One of those things is Carcassonne. While it may not hit the table frequently, it’s always a welcome guest when it does. And Inns & Cathedrals is, as @FarmerLenny says, a necessary extension. Everything Lenny said was true, so I don’t have much to add, just a few words. I want to reiterate that the most important aspect of this expansion is the set of new tiles. Aside from the pieces you get that fill in more ridiculous holes in the puzzle, the new pieces tend to divide up the playing field as far as farms go. In the base game, things often devolved into players fighting for a huge farm that touched every city on the board. It was just too hard to divide things up, even if you were trying. It was always too easy to circumvent a city or corner a road just so. The base game and TWO expansions all fit in the original box (that bag is a teaser). The new tiles have cities that extend to the corner, more “impassable” tiles that run roads out of cities, and generally more division. This is a good thing, as it breaks down ungodly large farms and keeps the realm of strategy within a reasonable level. You can focus on roads and small cities and come out on top, without worrying about someone scoring 8,000 points from the farm at the end. Not that it makes farms worthless; you just have to choose more carefully when you go into one. So yes. 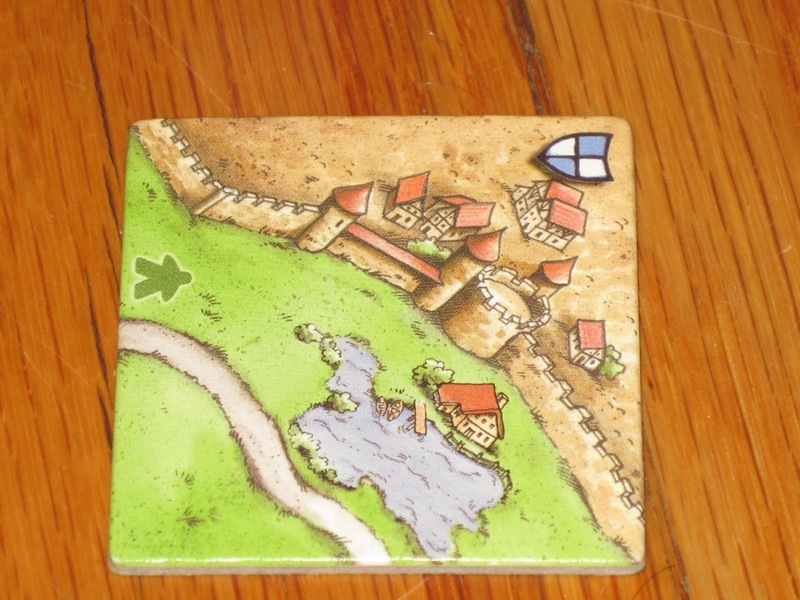 If you enjoy Carcassonne, Inns & Cathedrals is the next step for you, and it won’t even cost you that much.